The short haired Manx and the longhaired Cymric are the only tailless cats in the cat fancy world. These shy cats have a unique flared ear set. The Manx have a rabbit-like gait due to their cobby body and height of their hindquarters. They are polite, reserved ladies and gentleman. 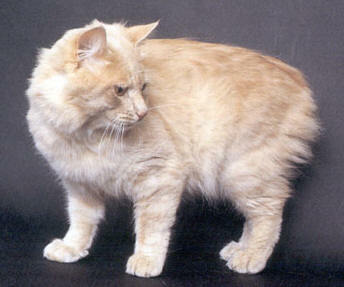 Description: The key word in describing a Manx is round; round head, round chest, round rump. The overall appearance should be that of a medium sized, compact muscular cat having the look of bear with no tail. The head is slightly longer than broad, with a gentle curve below the bridge. The broad muzzle is slightly longer than wide, with a definite muzzle break and large, round whisker pads. The cheek bones should be prominent; there should be jowls, especially in an adult male. The placement of the medium-sized ears is very important; they must be set wide apart, so that when viewed from behind they flare out to resemble the rockers of a cradle. The eyes are round, large and full. 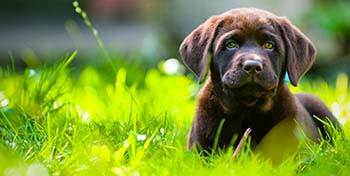 The medium-sized body is cobby, with sturdy boning and is well-muscled, including the legs, giving a robust, stout appearance. The hind legs are higher than the front legs. The short back forms a smooth, uninterrupted arch from the shoulders to the rump, curving at the rump to form the desired round look. There should be great depth of flank, adding to the cobby appearance. Taillessness must be absolute in the perfect specimen. The Manx has a short, soft, plush coat. History: There are some outlandish stories about how tailless cats came to the Isle of Man, where they may indeed have originated. Some say the Irish brought the cats to the island, using the cats� tails as plumes for their helmets. Other say Phoenician traders brought the cats with them from Japan and thus the Manx must be related to the Japanese Bobtail. This cannot be true, in part because the gene causing the curled tail of the Japanese Bobtail is different. In another story, a tailless cat swam ashore from a ship of Spanish Armada. 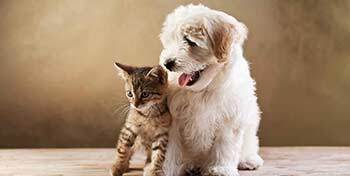 According to one or more story, the cat was aboard Noah�s ark and Noah shut the door on the cat�s tail, cutting it off. Taillessness is a result of a dominant gene that occurred a long time ago. Due to a high death rate among kittens, there is scarcity of Manx today. 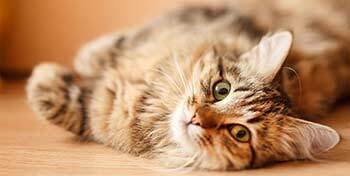 Kittens from a homozygous dominant will die during the foetal stage, when the development of the spine is hindered. Temperament: Once the kittens are past the endangered stage of development, they grow to be strong, healthy adults. The Manx makes excellent pets. They do tend to be loyal to only one person and aloof but not unkind to others. They are excellent hunters and enjoy tree climbing. They are quiet, rather reserved cats and are excellent, faithful companions especially for the person living alone.